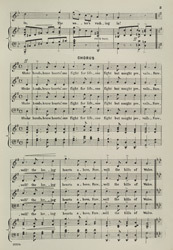 Music Hall songs were often about social issues. They were about the people, for the people, they applauded the labourers, the miners, and the factory workers. This song gently encourages the middle classes to remember that the coal for their fires comes from mines and to remember the hardworking miners. Coal mining became Wales' primary industrial activity and by the 1890's Cardiff had become the world's leading coal exporter. The song also narrates a disaster in a coal mine when it burst and water rushed in trapping some miners. They were rescued but it reminds listeners of the dangerous conditions in which they were working.